After an exciting first day of Ryder Cup action, the U.S. squad emerged with a 5-3 lead thanks to a strong afternoon session. The sides split the four matches in the morning alternate shot matches, but the Americans dominated the best ball play winning three of four available points. The unquestionable star of this Friday’s play was American rookie Keegan Bradley. Bradley paired with Phil Mickelson during both sessions and the team secured wins over an all-star cast of Europeans – Luke Donald and Sergio Garcia in the morning, and Rory McIlroy and Graeme McDowell in the afternoon. 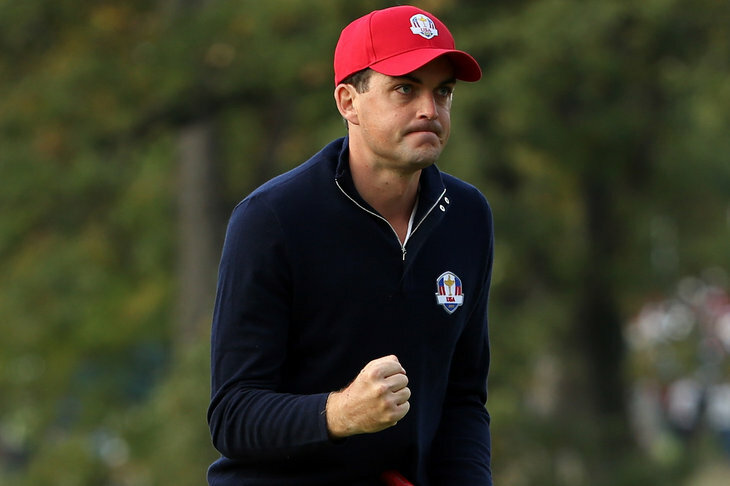 The pairing of Donald are Garcia had never lost a foursomes match in Ryder Cup play, until Bradley holed a 25 foot birdie on the 15th hole to finish them off. That birdie capped a run of four straight holes won for the Americans, turning a close match into a runaway. The afternoon match stayed tight until the end, but was iced when Mickelson slammed a seven-iron in to tap in range of the par three seventeenth. The hole was halved with twos, and the U.S. closed out the match 2up. On the other side of the spectrum, Tiger Woods was held without a point on the first day for the 4th time in his cup career. Woods played dreadfully in the morning, spraying tee shots all over Medinah and placing Steve Stricker in some rough spots. The pairing of Woods and Stricker failed to break par in the morning session while falling to Ian Poulter and Justin Rose 2 & 1. The style of golf Woods is playing of late just does not lend itself well to alternate shot. The only player in the world with enough talent to succeed from the place Tiger has been hitting it, is Tiger himself. When another player is forced to deal with those spots, the results are not going to be good enough to win. Captain Davis Love III stuck with the Woods/Stricker team in the afternoon, and the outcome was the same, yet different. Woods played much better, carding seven birdies on his own ball. Unfortunately for the Americans, however, Nicolas Colsaerts was flat out on fire. Shooting what would have been a 62 on his own card, Colsaerts made a whopping eight birdies and an eagle. Lee Westwood was basically along for the ride as the Ryder Cup rookie from Belgium rolled in putt after putt. The match did last all the way to the 18th, but Europe prevailed 1 up for their only point of the afternoon. Another dynamic pairing for the U.S. was the afternoon team of Bubba Watson and Webb Simpson. Watson was seemingly made for best ball play with his huge drives and aggressive style. But it was Simpson that had the U.S. team sprinting out of the blocks with three birdies, and holes won, in the first four holes. As Simpson cooled off, Watson picked it up in turn, make three birds in a row from holes 6-8 to give the U.S. side an incredible 6 up lead. The Euros would only get one point back, and the U.S. finished the match off 5 & 4. The most notable example of the Ryder Cup pressure exerting itself was probably Brandt Snedeker off the 18th tee in the morning matches. After mounting a comeback from three down, Furyk and Snedeker had gotten to the 18th tee all square. With it being Snedeker’s turn to tee off, he sent his drive sailing wide right some thirty yards off of the fairway. The U.S. would make bogey from there, and drop the match to the par of McIlroy and McDowell. So all in all, a very successful day one for the American side at Medinah. Likely the underdog coming in, having lost three of the last four matches, the two point lead the U.S. emerged with is a decided edge. With Europe traditionally not as good in singles play, the pressure will be on them to rally Saturday in order to be in striking distance on Sunday. With the crowd obviously against them, a final day comeback of more than a point of two would seem to be an impossible task. Europe will be looking for at minimum a split of the points in Saturday’s play if they want a legitimate shot at retaining the cup.